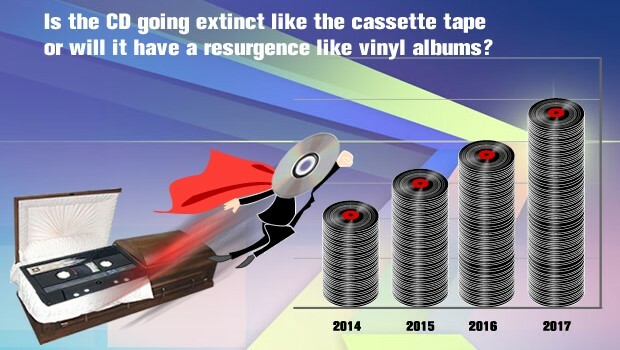 Is the CD going extinct like the cassette tape or will it have a resurgence like vinyl albums? Often when I mention to people that my company sells CD duplicators or when I’m exhibiting our products at a trade show, it’s not uncommon for the people to ask, “who buys CD’s anymore?” My typical response is to mention that music CD sales are still a billion-dollar business, and that sales of recordable CD-R are well over +500 million pieces a year in the U.S. alone. That doesn’t mean that the market share isn’t decreasing, it’s just that it’s nowhere close to becoming extinct or a novelty item like the cassette tape. Could CD’s eventually disappear? It’s hard to say for certain, but my bet would be no. In fact, I think CD’s will continue to hold a special place in the hearts of music enthusiast around the world for its unequalled clarity and sound quality. Take for instance, vinyl albums. It was widely believed vinyl albums were headed for extinction, like the Woolly Mammoth. But yet, they have been resurrected, like an audiophile Jurassic Park. In fact, sales of vinyl albums increased to 14.3 million in 2017, up from just 1 million in 2007, according to Nielsen Music. The same music can be found digitally, but the consumers that bought these vinyl albums did so because they specifically wanted to own the physical media in a format they have a special affinity for. I believe the same will be true for the CD. Not only is the CD the most versatile format for content storage, in that it is commonly used to hold music, videos, photos, X-rays, documents, etc., but it’s also the most affordable storage format as well. There still is and will continue to be a large segment of the population that realize it’s important to own tangible products like CD’s that they can store and reliably play anytime they choose. When you are looking for recordable media, especially CD-R, that will consistently and reliably burn without flaws and playback without errors, Vinpower should be your preferred supplier.